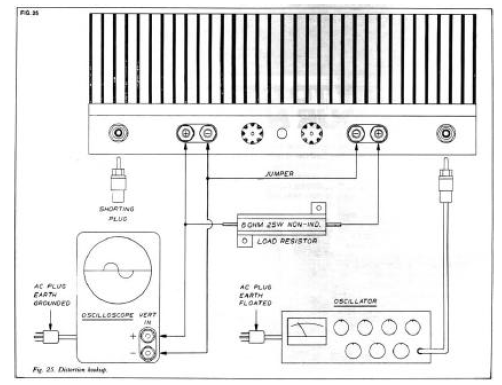 Audio Amateur has published a number of projects modifying popular kits, usually Dynaco's. Obviously it is much less expensive to use the chassis and power supply, pots, connectors, switches, PC boards, and heat sinks that can be had for the price of a kit than to buy the components individually or have them made. Creating a one-off copy commercially typically costs as much as making 10 copies of the same item, because the dominant costs are design and set-up time which do not increase with quantity. Small wonder then that most technicians and designers who write for this and similar magazines base their projects on yesterday's readily available kits, which, often as not, languish unappreciated in closets and basements. This is one such project. We will, however, do two things here you may not have seen before. We'll modify the Harmon Kardon Citation 12, a popular device which has somehow escaped the kit modifier's attention; and we'll do so with power mosfet circuitry instead of the traditional bipolar power transistors. This project is for experienced builders only, and Harmon Kardon want me to remind you that it will void any warranty coverage on the Citation 12. The Citation 12, introduced about 10 years ago, is based on the circuitry found in the RCA transistor manuals (for example, see RCA data sheet file #647). 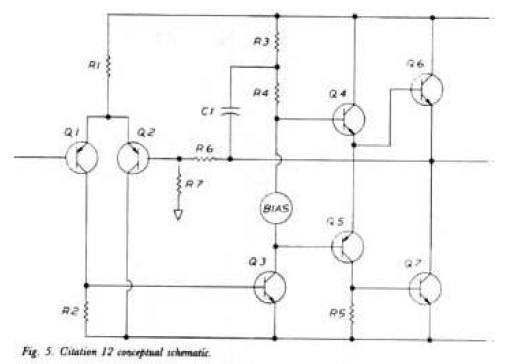 This circuitry was the basis for nearly all the quasi-complementary designs in existence, as typified by the large power amplifiers of the early '70's. In its time the Citation 12 was a truly excellent amplifier, employing a number of concepts which have only recently become popular: dual split power supplies, DC output coupling, and no active current limiting. These characteristics allowed it to sonically outperform the Dynaco 120 which was its popular competitor. It could drive anything with high reliability, and in the time I spent as a repair technician I fixed a few Dynaco, Phase Linear, McIntosh, Pioneer, and Sansui amplifiers, but I've never seen a broken Citation 12. 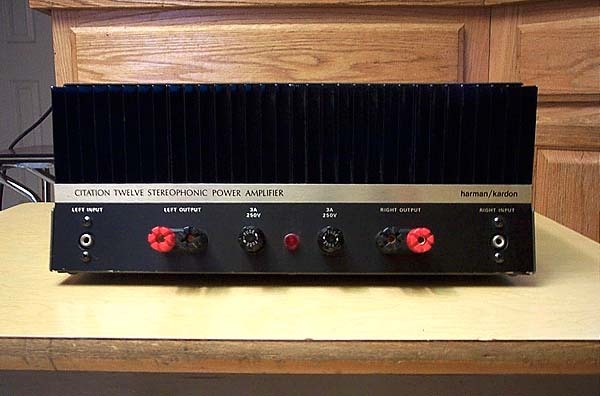 I have another, nostalgic, reason for choosing the Citation 12: it was the first amplifier I built myself. 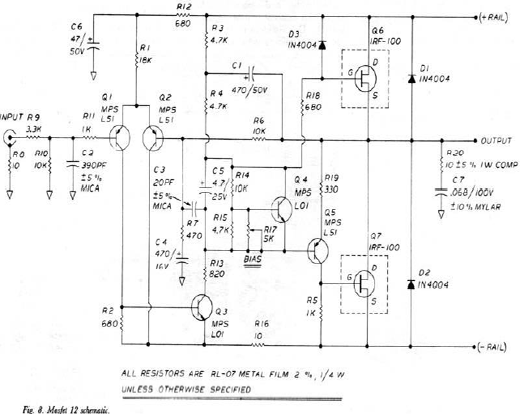 About eight years ago, when I was an impecunious student working parttime for ESS Inc. (no, I did not design their electronics), the home-brew power amplifier built by a friend broke down, leaving me without music. Like most of you in a similar position, I decided to do without some other necessity, and shortly my kitchen table was covered with solder blobs and the parts to the Citation 12. I decided to fire up the completed unit on a variac instead of merely plugging it into the wall' and was dismayed to discover that both channels exhibited extremely large DC offset when I applied AC power. After some weeks of rechecking my work and finding no errors, I finally decided to connect it up and plug it into the wall anyway*. When I did, the woofers on my speakers plunged fully forward as if attempting to escape the amplifier, but after a few seconds they returned to normal and music appeared. Thus I discovered one of the Citation's few faults: an enormous subsonic turn-on thump. I kept the amplifier for several years and ultimately sold it to a friend, only to end up buying it back. It sat in my closet for a long time, a candidate for that perfect project, until one day at Threshold we discovered a vendor had accidentally shipped us several power mosfets instead of diodes, and this article began falling into place. The power mosfets, reasonable analogs of the hometaxial npn devices in the Citation 12, fit quite neatly into the original layout and provide for a state-of-the-art super-position upon a classic piece of circuitry, improving the speed and distortion characteristics in an even more simple topology than in the original. As is the case with most electronic components, an exact understanding of mosfet operation is a formidable goal, and I won't address it here, rather we will treat the mosfet as a black box possessing certain simple characteristics. 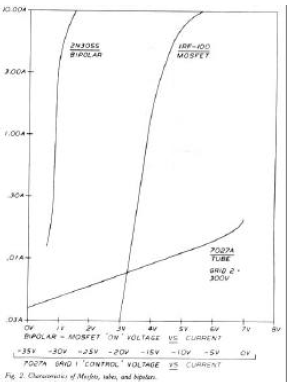 In the power mosfet we have a gain device which combines the best properties of tubes and bipolar transistors. Seen in Fig. 1, the gate is analogous to the grid and the base, the source corresponds to the cathode and emitter, and the drain corresponds to the plate and collector. higher transconductance and operates at bipolar voltages. Considered overall, the power mosfet is like a tube but retains the high transconductance and current of bipolar technology. Power mosfets can also be made complementary, with the p and n characteristics comparable to pnp and npn bipolar transistors, where the devices' polarity makes them mirror each other, a feature not available in tubes. The power mosfets used in this project are International Rectifier IRF 130's, a 150-watt, 100 volt, 12-amp device in a TO-3 style case. They are part of a relatively new line of transistors using IR's proprietary hexfet process, which combines a particularly high voltage capability with very fast switching times and low saturation losses. Except for the steep price tags, this type of device has a number of advantages over regular bipolar transistors in audio power amplifier use. First, their simple low current circuitry eliminates the need for driver transistors. Second, they are immune to the second breakdown phenomenon, which robs bipolar transistors of their power rating at higher voltages. This breakdown results from the positive temperature coefficient which encourages local current hogging within a area on the chip, so that at higher voltages one small part of the transistor tends to do most of the work, resulting in more probable failure. In a power mosfet the temperature coefficient is negative, and energy dissipates more evenly across the surface of the chip, allowing full power application at the highest rated voltage. This characteristic also avoids the bipolar design problem of thermal bias runaway, and eliminates costly compensations to maintain reliable operation over a range of conditions. Third, because mosfets are majority carrier devices (bipolars are minority carriers) their intrinsic speed is much higher. Rise and fall times are about 150ns while similarly rugged bipolar devices have rise and fall times several factors larger. Basically, there aren't any. Some advantages popularly attributed to them are however, not necessarily true. For example, the negative temperature coefficient does not in itself guarantee the device is indestructible. 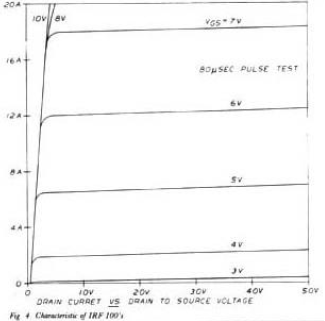 While this characteristic eliminates the second breakdown mechanism, it does not offer better reliability at lower voltage levels, so that in many well designed bipolar amplifiers (including the Citation 12) this effect does not provide for significantly better reliability. In many applications the power mosfet will exhibit greater linearity than bipolar devices. An important exception to this is when the device is used as a follower driven by a low impedance source. In this case, the higher intrinsic transconductance allows for more accurate voltage following and experimentally, bipolars show about one-third the distortion of mosfets. Also contrary to popular conception, power mosfets may not necessarily be paralleled without the use of source resistances to equalize the current draw between devices. Unless the devices are matched, the designer cannot assume that one device will not take on more or less than its share of the load. In more than one commercially available amplifier paralleled mosfets are accompanied by source resistors, to ensure that their characteristics are equalized. One more aspect affecting these device's audio quality is their relatively high intrinsic capacitance, on the order of 500-1000 pF, which makes special demands on any circuitry which would realize the high speed capability. For example, the current required to slew 100V/uS into 1000pF is .1A, a considerably higher current than most front end circuits are designed to source without an additional Rain stage. Fortunately, in actual use much of the capacitance is associated with the gatesource, which sees only a small fraction of the gate-to-drain voltage swing. In our project amplifier, .003A from the front end circuitry will drive the positive output transistor's capacitance at about 40V/uS for an effective capacitance of some 100pF. This is about five times better than the raw capacitance figure quoted for the device, indicating that most of the effective capacitance is gate to source. I must mention one final and actual drawback. Because the transconductance is low compared to bipolars, there is significant loss in maximum power for a follower unless the source voltage can deliver several more volts than the supply to the output transistor, resulting in either lower efficiency, or the use of tiered power supplies to feed the amplifier's front end several more volts than the output stage. The IRF 130's selected for this project are sufficiently similar to the original HK- 12 devices that they fit into the amplifier's quasi-complementary topology with a minimum of modification, as seen in the simplified schematics of the HK-12 and the project circuit in Figs. 5 and 6.
complementary action from Q7, the negative output transistor, and Q4 provides the follower current gain to drive Q6, the positive output transistor. The Fig. 6 circuit is basically the same; but Q6 and Q7 have become power mosfets and Q4 has disappeared because the additional current gain is not required to drive Q6. In Figs. 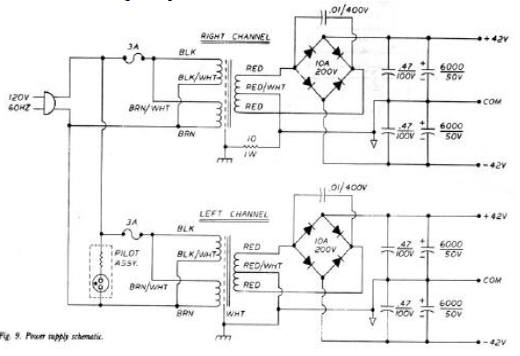 7 and 8 we see the actual schematics of the two power amplifiers; for clarity the part numbers correspond to Figs. 5 and 6. In Fig. 8, R11 and C7 filter the power supply line to prevent ripple and transients from modulating the bias, causing noise and distortion. R12 and C2 form a low pass filter to prevent spurious high frequency input signals from being amplified. 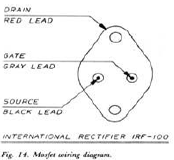 Resistor R1 feeds 2mA of current equally to Q1 and Q2. The 1mA of current through Q1 then goes through R2 to provide the approximately .65V bias between the base and emitter of Q3. This DC current with an AC component modulates the current through Q3, which, passed through the high impedance of R3 and R4, (bootstrapped by C1) produces a large voltage gain at the collector of Q3. This voltage gain is followed by Q6, and on the negative half of the circuit, by the Q5, Q7 combination. In this scheme of things, R5's action is similar to R2's , and R9 limits Q5's gain. 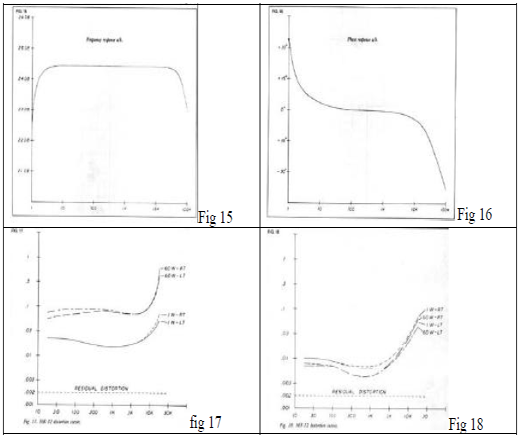 The combination of R16, R,15, and R10 damp out the resonances which would develop from the combinations of gain devices and internal capacitances, and prevent parasitic oscillation. C6 is in series with R10 to ensure that this resistor is not driven by audio frequencies, which would overheat and destroy it. C4, a damping capacitor, enhances the circuit's stability by providing a secondary high frequency loop, causing the feedback loop to ignore the output's high frequency operation in favor of the front end's low-order output at frequencies above 800kHz. This allows the amplifier's input stage to dominate the high frequency response with a less than two-pole characteristic, providing for high stability under transient conditions. The bias network of Figs. 5 and 6 has been replaced by Q4, R17, R18, and C5, forming a constant-voltage source trimmable by R17 and frequency-stabilized by C5. D3 ensures symmetric clipping, and D1, D2 provide a current path for the flyback energy which an inductive load may produce. R6, R7, and C3 form the feedback loop, with a low frequency rolloff of .7Hz. A word is appropriate here to explain the operation of the bootstrapping circuitry of R3, R4, and C1. The idea is to cheaply achieve the effect of a constant current source load for Q3, where the AC impedance of the load is very high, giving maximal gain for that stage, and whose DC impedance is R3 + R4 (9.4kohm). 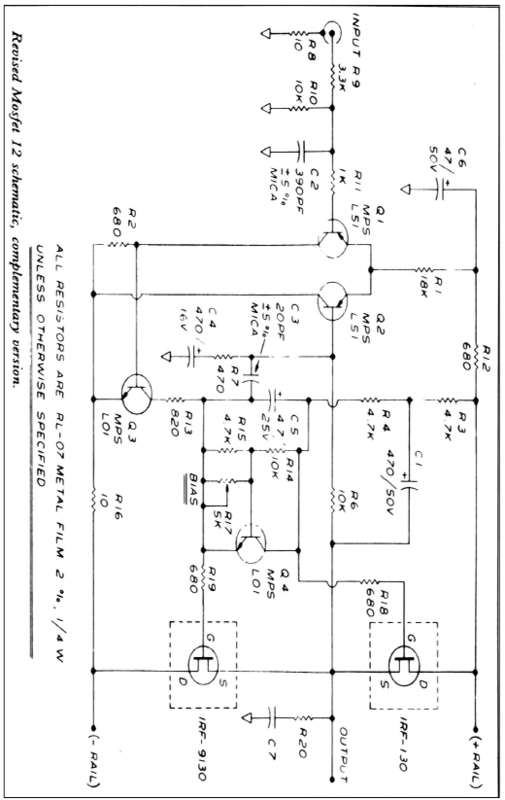 This provides about 3mA of DC class A bias current for Q3 without loading the gain stage. 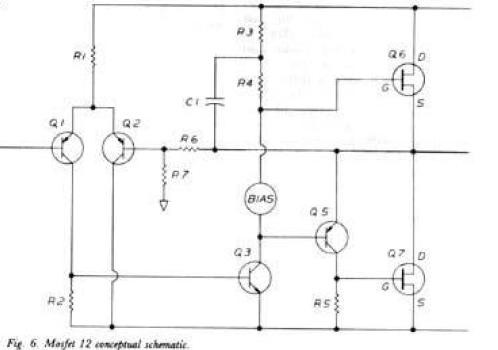 This effect occurs because the point between R3 and R4, is bootstrapped by C1, which is connected to the amplifier's low impedance output and causes the node between R3 and R4, to follow the output. Because the output voltage is nearly identical to the voltage at the collector of Q3, the voltage across R4 is nearly constant, resulting in effectively constant current through R4, the action of a constant current source. In this way, Q3 can swing full output into an 8 ohm load with only about 10 percent variation about the bias current, as opposed to the +/- 100 percent variation that would occur without the bootstrapping. This contributes greatly to the system's gain and linearity and achieves the highly desirable effect of the constant current source with great simplicity and little cost. The effect is good across the AC band, rolling off at about .14Hz on the low end and at about 300kHz at high frequencies. Start by removing the PC board and stripping off all components except the connectors. Use solder wick or a solder sucker, and take great care not to separate the copper foil from the PC board. You will also have to remove many of the components from the underside of the chassis (see Fig. 13), including the heat sinks. While you may elect to retain the original input and output connectors, I replaced mine with higher quality goldplated types. You may also elect to retain the original amplifier's output breakers and/or thermostats; however, I removed them as unnecessary. Personally, I don't trust the quality of connection offered by the output transistor sockets (especially old ones) and I decided not to use them, preferring solder connections to the TO-3 pins. Remove and discard all the capacitors on the underside of the chassis except the four computer grade electrolytic power supply capacitors. 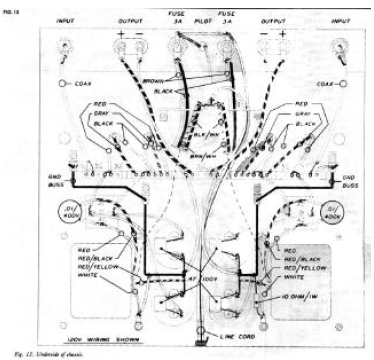 Figure 13 shows the primary AC wiring; it lacks the thermostats but is otherwise virtually identical to the original. Mount the power mosfet output devices on the heat sinks, using mica TO-3 insulators, silicone grease, plastic shoulder washers, 6-32 screws/washers/nuts, and a solder lug for electrical connection to the transistor case (drain). Figure 14 shows the output transistor wiring with the lead wires soldered to the pins. The wires from the outputs feed down through the holes in the chassis to the connector pins as shown in Fig. 13. After mounting the output devices to the heat sinks, check first for possible connection between the transistor case or either of the two pins and the heat sink. Use an ohmmeter with one probe connected to an unanodized portion of the heat sink, (possibly in the tapped holes) and the other probe touching the various parts of the transistor. The transistor must not connect with the heat sink. When you have mounted and wired the output transistors, reattach the heat sinks to the chassis and solder the wires to the PC board connector pins. Note in Fig. 13 that some of the pins are hardwired together to achieve the best possible connector contact by paralleling connections to the PC board. Also shown in Fig. 13 are the .47uF/100V capacitors which I placed in parallel with the power supply capacitors to achieve lower dissipation factor at the highest frequencies. These are optional and the amplifier will run quite well without them. I also placed .01uF capacitors across the diode bridges to suppress rf emission by the diodes; these too are optional. Figures 11 and 12 display the component layout on both sides of the PC board and are selfexplanatory. Please note the 18 gauge jumper wires on the back. Two replace the coil/resistor in series with the output of the original circuit (a standard feature on 99 percent of today's solid state amplifiers), and to reduce the distortion inherent in the original PC board. The original PC artwork, of which more than one version apparently exists, takes the feedback from a point separated from the actual output node by a short length of copper which carries an asymmetrical portion of the output current. The feedback thus operates off a voltage several milivolts removed from the actual output generating even-ordered distortions. As always, take special care to orient the polarities of the components and avoid damaging the components by overheating the leads when soldering. As this project is for the more advanced home-brewer, I will not mention that the use of a solder gun is forbidden. Leave the TO-92 transistor leads as long as possible. Q3 and Q5 require press-fit heat sinks. When you first switch on the amplifier, turn the bias pots so as to exhibit maximum resistance. This minimizes the amplifier's initial bias current when first fired up, a valuable safety precaution which should be checked with an ohmmeter. The pot's wrong extreme setting should read about 0 ohms and the right setting will read 5000 ohms, depending on the polarity of the probes (note the pn junction of the bias transistor). The following test is important, and should be carefully performed, first on one channel and then for the other. Remove the AC line fuse of the channel not being tested and install a 1A fast blow fuse in the channel being tested. Drive the channel at a low level (. 1V) at 1kHz by an oscillator whose ground is floating with respect to the oscilloscope (you can do this by using a 3-to-2 prong cheater adapter on the oscillator's AC line if it has an earth connection). The oscilloscope itself should be earth grounded. Measure the output without a load, connecting it and its ground to the oscilloscope input. Set the scope vertical scale at 5V/div and the horizontal at .2mS/div. Using only a variac, slowly raise the line voltage to the channel while watching the output. The output voltage should exhibit DC offset at first and then settle into a +/- 2V sine wave; if it does, continue to slowly raise the voltage until the full line voltage is achieved. If you manage this without blowing the fuse, the next step is to slowly increase the input voltage from the oscillator until the output reaches clipping (at about +/- 30V), watching for oscillation or severe distortion. Having accomplished that, repeat the test for the other channel. When both channels operate successfully without a load, repeat the test for each channel with a 4A fuse and an 8ohm load, still watching for waveform problems or fuse blowing. You will see crossover distortion at this point, which is normal for an unbiased amplifier. 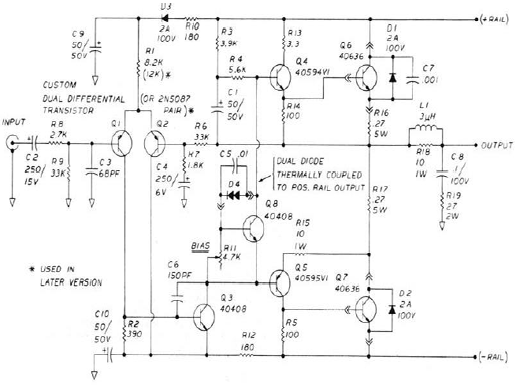 When both channels can successfully drive an 8ohm load at full power, it is time to bias the amplifier's output stage. Put most simply, we want to adjust the bias potentiometer so as to remove crossover distortion, a condition which corresponds to about 100mA of idle current through the output stage. We can do this as follows. Using the test setup shown in Fig. 25 (see following paragraphs) and with the drive channel at +/- 8V into the 8ohm load, look at the notch distortion on the other channel and adjust the bias potentiometer until the spike just disappears and no' more. Be careful here: it is easy to set the bias too high in search of perfection. Disconnect the load and monitor the operating temperature of the channel for 15 minutes by placing your hand on the heat sink. Ideally the channel should operate slightly warm at idle. If it becomes hotter than this, adjust the bias current down. If it stays cool, you may with care, slightly increase the bias. After 15 more minutes recheck each channel's temperature and distortion, readjusting as necessary. If you are fortunate enough to possess a current probe, this entire procedure can be accomplished by simply setting each channel to draw 100mA from the supply, again rechecking after 15 minutes. Alternatively, you may monitor the bias current by inserting 1 ohm in series with the positive power supply lead and measuring 100mV DC across it. It may surprise you to know that one can quite easily perform cursory distortion analysis on this (and many) power amplifiers using an 8ohm power resistor, an oscilloscope, oscillator, and the amplifier itself. 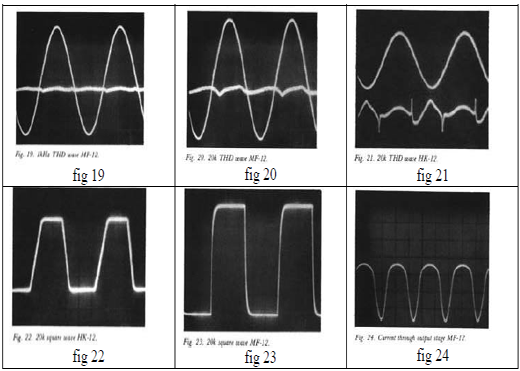 The oscilloscope need not be of particularly high quality and the oscillator need not have low distortion. Figure 25 shows how one amplifier channel (A) uses the oscillator's signal to source current into the other channel (B) through an 8ohm resistor. At the output of channel B we will find that channel A's voltage output has been divided by channel B's damping factor. In this amplifier the broadband output impedance is .064ohm (8/.064 = 125 damping factor), resulting in a condition where channel A's voltage output is reduced to .8% at the channel B output, plus the distortion of channel B caused by sinking the current. At channel B's output we therefore see the channel's notch and other distortions in response to channel A's drive conditions, but much less obscured by the fundamental voltage. Because in this and most other amplifiers the distortions are dominated by current fluctuations (a concept addressed by the Stasis amplifiers) this serves as a useful and inexpensive bench technique and for the most part it is easy to see the distortion added to a .8% fundamental. This procedure is useful in biasing the amplifier as you can clearly see crossover notch and other effects. This test will also reveal distortions caused by poor connections between the PC board and the connectors (something I encountered in the actual unit and which I cured by cleaning and reseating the connectors). To evaluate the percentage of distortion remember that the voltages seen by the 'scope divided by the output voltage of the other channel will equal the fraction of distortion. For example, if channel A's output is at +/- 28V (20VRMS) through the 8 Ohms into channel B, then channel B's output will show a signal comprised of channel A's fundamental divided by the damping factor (for +/- .225V sinewave) plus an equivalent of channel B's distortion when operated at that level into 8ohm. In this case a .28V peak distortion spike would indicate a 1% peak distortion (not uncommon in amplifier's with . 1% average distortion). Figures 15-24 document the performance of the prototype amplifier, which was built without selected components. Of particular note are the distortion and square wave comparisons against the original, showing a significant improvement in distortion characteristic and transient response. Figure 24 shows the current waveform through half the output stage. Note that the current through the output device idles down instead of shutting off abruptly as in bipolar Class B and AB amplifiers. This gives reduced crossover distortion and the quasi-Class A operation at lower levels which otherwise we could only achieve in a bipolar circuit with dynamic biasing. The amplifier is sonically a significant improvement over the original, particularly in the high end where the Citation 12's veiled characteristic is replaced by a detailed, somewhat sweet sound. The imaging and midrange definition are also much improved; but the bass response (one of the Citation 1 2's strongest points) remains much the same ideal for planar loudspeakers like MG II's, less so for acoustic suspension woofers. In conclusion, I hope many of you will try this one and enjoy yourselves. No amplifier sounds as good as the one you built yourself*, and certainly no commercial amplifier will give you as much satisfaction or frustration. As careful as the Editor and I have been, there is probably an error or two; I recommend that you cross-check the parts list, schematic, and pc board layout. My amplifier has performed well for six months, as of this writing, and I encountered no exotic problems during its construction and testing.